In the Southern heavens is found a constellation call Crux. Every Australian who has gazed upon the night sky has seen the Southern Cross and knows it well. As well as adorning the Australian National Flag, the Southern Cross is an important symbolic and spiritual symbol for all Australians. The tradition of Our Lady of the Southern Cross finds an inspiration in this cross of stars. Pope John Paul II, in address to the Aboriginal people of Australia in 1986, said… “It is a great joy for me to be here today in Alice Springs and to meet so many of you, the Aborigines and Torres Strait Islanders of Australia. I want to tell you right away how much the Church esteems and loves you, and how much she wishes to assist you in your spiritual and material needs. As the human family spread over the face of the earth, your people settled and lived in this big country that stood apart from all the others. Other people did not even know this land was here; they only knew that somewhere in the southern oceans of the world there was “The Great South Land of the Holy Spirit”. In 2010, Australian artist Paul Newton was commissioned by His Eminence George Cardinal Pell to paint 32 works for the chapel of Domus Australia, the new Australian pilgrim centre in Rome, which was opened by Benedict XVI in 2011. Pride of place in the chapel is given to a picture of Our Lady of the Southern Cross. This picture is similar picture Mr Newton painted for World Youth Day, 2008 which now hangs in Saint Mary’s Cathedral, Sydney. A new icon was commissioned by the Ordinariate of Our Lady of the Southern Cross in 2015 as part of the Ordinariate’s desire to have its own unique imagery, drawing on the wealth of its English ecclesial heritage and Australian surrounds while also embracing the iconographic tradition which emerged largely in the Orthodox East. The new icon, was developed by icongrapher Michael Galovic, who hails originally from the Balkans. In an interview to announce the new icon, Mr Galovic, said the icon is not an artwork, but a deliberate distortion of human bodies and geometry – a surrealist blurring of form and theology – unveiling the mystical reality of that which it depicts. The new icon was officially blessed on 24 January in Perth by the leader of the Australian Ordinariate, Mgr Harry Entwistle, in the church of St Ninian and St Chad where it will reside. 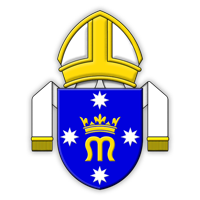 Under the Patronage of Our Lady of the Southern Cross and with her prayers the Personal Ordinariate in Australia shall shine like the stars in heaven.